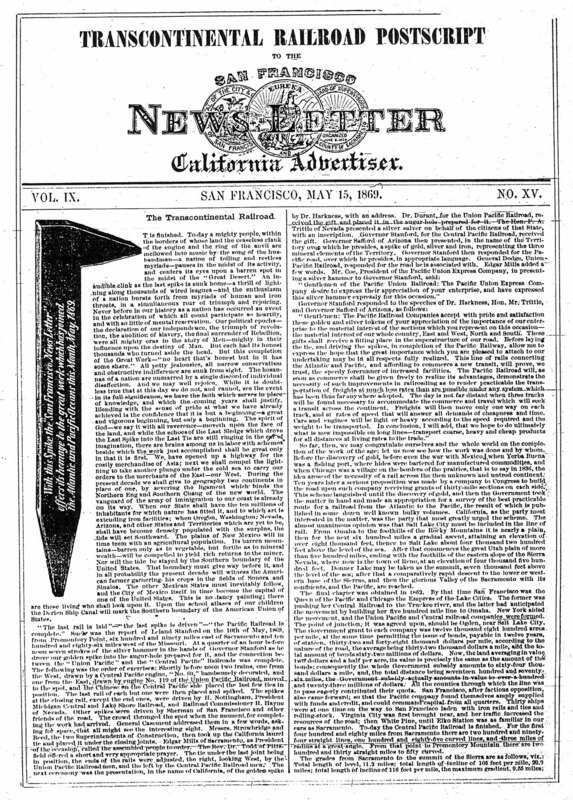 The Second Gold Spike - San Francisco News-Letter and California Advertiser, May, 1869. 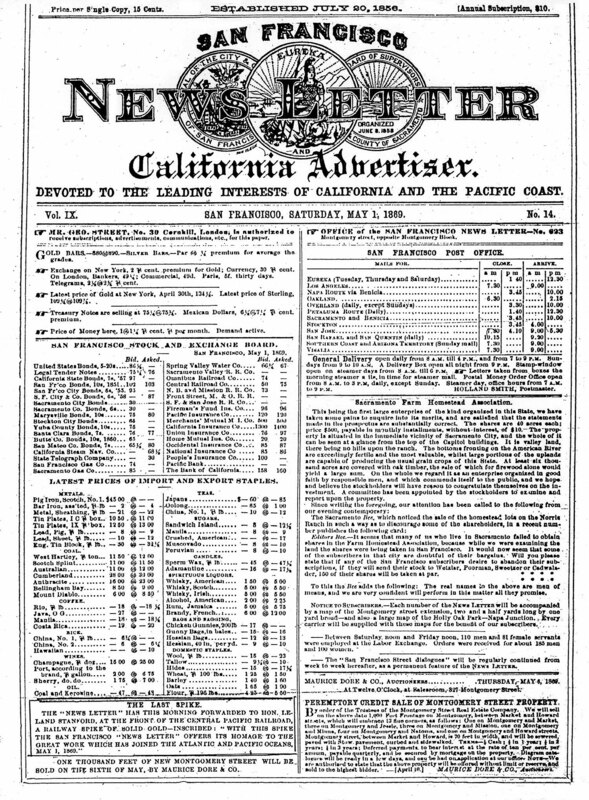 San Francisco News Letter and California Advertiser, May, 1869. 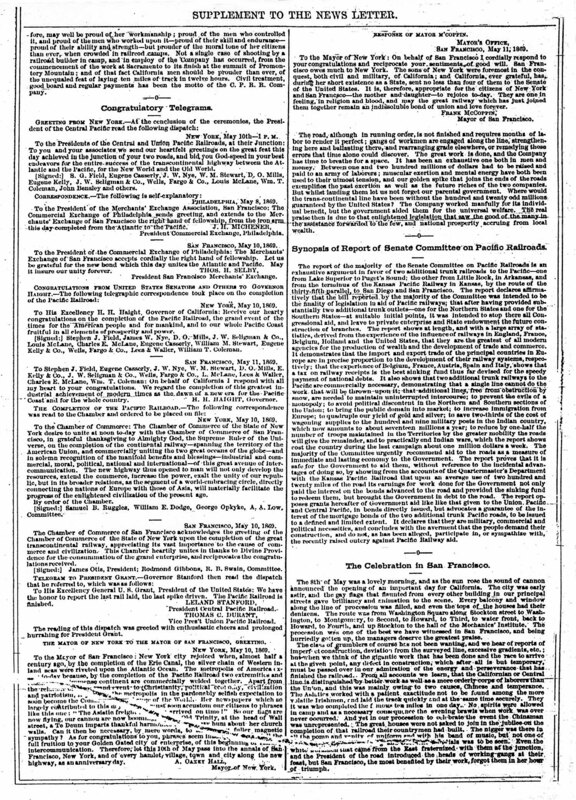 Including the Transcontinental Railroad Postscript. > I'm trying to trace the 2nd Golden Spike. ... I have either a replica of the spike, or the real thing, itself, [see photograph, above] and am trying to figure out which. The trail ends almost immediately after its being "driven" - probably given to Gen'l Grenville Dodge of the UPRR. Don Snoddy, of the UPRR Museum has been thru Dodge's papers and has found no references to it, so it might have gone to someone else right after the ceremony. The original was photographed by the firm of Bradley & Rulofson. ... The 2 spikes were produced by different jewelers. They probably traveled from SF to Promontory together. I have seen references to the Hewes spike with attached nugget (or sprue) as being 2 spikes ... Specific gravity is 10.24 or 10.25, consistent with a high purity silver. The thing is gold plated. It is, however, the size described in the S F News Letter write-up AND THE CORRECT WEIGHT. This leads me to believe that Mr. Marriott (publisher of the SFNL and an important SF public figure and occasional crook) was pulling a fast one. The Hewes spike is usually spoken of as being worth $350 and the SFNL one as being worth $200. If the $350 doesn't include the nugget, and the 2 spikes are about the same size (volume) then Marriott's was a gaffer. I have a crackpot theory that this was discovered at the driving and the SFNL was ducked out of sight as an embarrassment. I would expect the gentlemen at the ceremony to have a good feel for the relative heft of gold vs something less valuable. 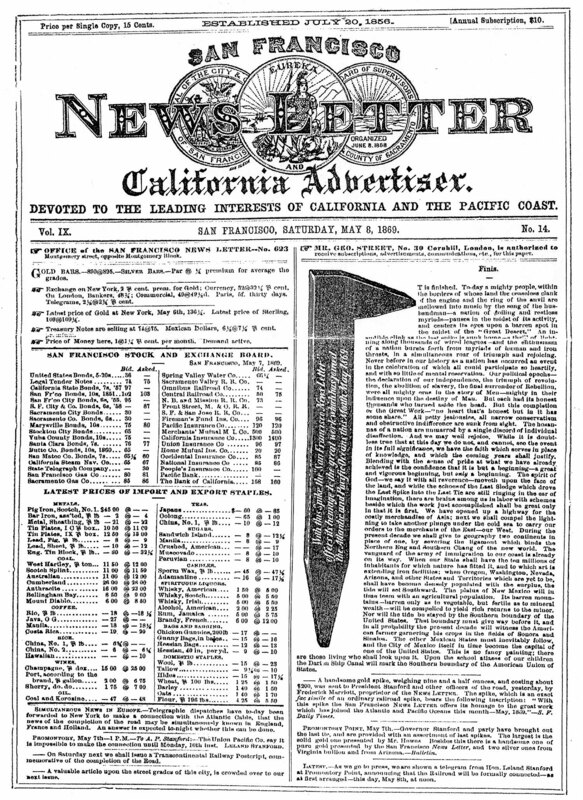 In 1869, commerce was conducted in metal. Currency, with the exception of National Gold Bank notes, was not trusted. Wealthy folk hefted gold every day. ... An oddity of all this is that I am also connected up with the Ames family from North Easton, MA, next to my home town of Brockton. My family made shoes in North Easton and rented the old Ames shovel factory building, then called Siberia, as everything metal had been stolen out of the building, including the heating system. There were 4 huge crates of shovel business papers, starting, unfortunately in 1874 rather than [the 1860's], but then the UPRR stuff would not have been there anyhow. I have some of the papers but the building was burned down before I got too far. 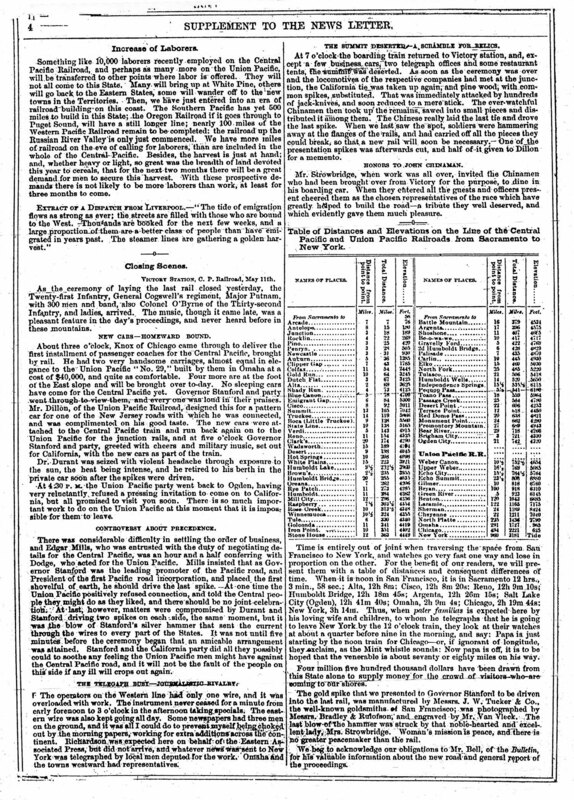 Through other means, other Ames papers and their display from the Centennial Exposition of 1876 have been given to Stonehill College, which is on the estate of one of the Ames brothers. ... Only 1 face is engraved. ... I can't do much on the provenance. An antique dealer friend of mine who lived in Southwest Harbor, ME, (on Mt. Desert Island along with Bar Harbor ... ) bought it in, I think, the late 1960's, probably on the island. ... the head curator at the California State RR Museum in Sacramento hates the spike - thinks it's a replica - doesn't like the plating color, is suspicious of the engraving. I started on my search wondering how many of these things were made, who got them, and when. The further I've gone, the less reason I have to believe that any replicas were made. This thing just sunk out of sight and would not have been around to copy, altho the newspaper cut would have been adequate. There would have been no reason to hawk these things other than some kind of swindle. The Hewes spike was famous. This wasn't. I looked at a lot of SFNL's and found only 3 references, all of which I'll send you and all of them between May 1 and May 15, 1869. There was no mention in editions for the 1st, 5th, 10th (? not sure I found this issue), 25th anniversary of the ceremnoy. Likewise for the Diamond Jubilee edition in 1925. The last 2 had 1-page features of the event with every opportunity to toot their own horn but there was nothing on their own spike. Once again I think that maybe Mr. Marriott was happy to see it die. ... [The photograph of the two golden spikes] ... is mistitled and is 2 views of the Hewes spike. ... a cut [shown in the newspaper above] which matches the spike well but not perfectly. ... The line ends aren't quite the same. More important, I believe that the cut shows a pyramid point but my spike has a chisel end. ... the curator at the RR Museum in Sacramento doesn't like the style of the spike for 1869. James Joyce ... has written a book on spikes and from that book I see that my spike is right in there, particularly allowing for a fine craftsman making what is normally produced by a blacksmith. 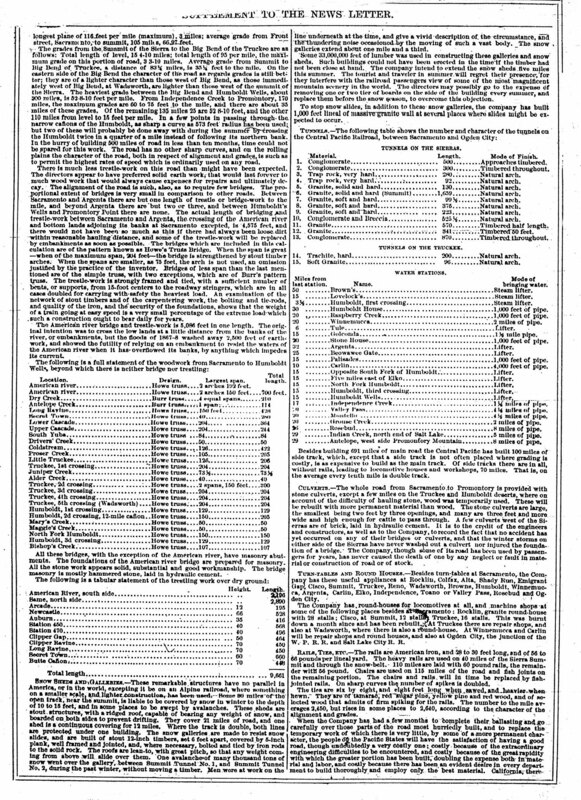 ... the 4-page "Transcontinental Railroad Postscript" from the May 15 paper. There was nothing on the RR in the other 12 or 16 pages of the regular paper. ... a rather pale gold - plating probably was thin, and it's been banged around some. ... —Harvey Fenton December, 2004.